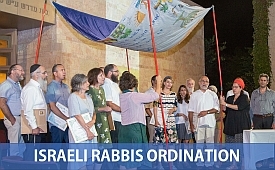 Fifteen participants in the Shalom Hartman Institute-HaMidrasha at Oranim Beit Midrash for Israeli Rabbis received ordination during a festive ceremony at the Hartman Institute in Jerusalem on September 5, 2018. The group had completed a two-year course of study. Program participants were selected from across the breadth and depth of Israeli Jewish life, and are already community educators and leaders. Rabbi Dr. Donniel Hartman, President of the Hartman Institute, said that the job of rabbis is to be both our tradition’s interpreters and its teachers. “It is with a profound sense of excitement and hope that I welcome you into the rank of Rabbi in Israel. The task before you is the same as that facing every Rabbi over the generations - how to enable more Jews to love their Judaism and be committed to it, and how to ensure that Judaism is in fact worthy of their love and commitment,” he said in his letter to participants. Our goal is to develop an open, pluralistic, rabbinical leadership, consisting of men and women, that will convene diverse communities and serve as their Jewish cultural visionaries. These leaders will strive for a Judaism that values life and hope, justice and righteousness, scholarly and innovative pursuits, and will serve as a relevant and unifying force in Israeli society. This Rabbinic leadership, which regards Israel as an integral part of the community of nations and is committed to respecting and honoring the rights of every human being created in God's image, will be poised to take Judaism into the 21st century, restoring the hope for all of Judaism’s branches worldwide. Read the complete vision statement in the event’s program booklet. The program is jointly administered by HaMidrasha at Oranim and Shalom Hartman Institute. HaMidrasha at Oranim promotes Jewish Israeli spiritual life based on shared Jewish and Zionist roots. Through education for all ages, spiritual community development, and leadership training, we are building a society of Israelis who feel at home in their Judaism, incorporate it in their individual and collective identities, and have a sense of shared destiny and mutual responsibility. The Shalom Hartman Institute (SHI) is one of the leading centers of Jewish thought and education, serving Israel and world Jewry. Our mission is to strengthen Jewish peoplehood, identity and pluralism and ensure that Judaism is a compelling force for good in the 21st century. The Shalom Hartman Institute - HaMidrasha at Oranim synergy has profoundly positive implications for the prolific operation of the Beit Midrash for Israeli Rabbis. Both SHI and HaMidrasha bring distinguished academic standing and vast expertise and experience in meta-denominational community spiritual leadership to the partnership. Neither SHI nor HaMidrasha are affiliated with any formal Jewish denomination, making this partnership especially suited for initiating a multi-denominational process. The program draws from the highly developed pedagogic approaches of both institutions to address the issues and challenges of contemporary Jewish leadership. Names of the new rabbis, as well as program sponsors, are below the photographs.